Kibworth Church is the second largest Church of Market Harborough Circuit within the Northampton District. Services are held at 10.30am every Sunday, and there is also an all age worship service at 5.00pm during term times. A great deal of other activities are also held at the Church during the week, for more information please see the activities and events page, or view our Welcome Booklet. For our safeguarding policy, please see Kibworth Safeguarding Policy 2018. We support The Well, a Christian prayer room and community centre with coffee shop, just round the corner from our building. For more information please see: The Well, Kibworth. We have the facilities for our church services to be put on to CD. If you would like to receive a CD please contact Mike on 0116 279 2766. The chapel has recently had underfloor heating fitted - the first stage of a number of planned improvements. For more information and photos please see Fit For the Future. This is a Fair Trade Church and Fair Trade products are used for refreshments and cleaning, including paper towels and toilet rolls etc. We encourage people who use the premises to help fight poverty by doing the same. 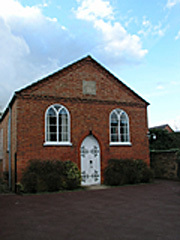 The Chapel is situated on the left side of School Road, about 50 yards in off High Street. Our premises provide facilities for a wide range of activities, available for the village to use at no charge (though donations are accepted). Click Contacts for Booking Secretary. (Early reservations recommended to avoid disappointment). You shall love the Lord your God with all your heart and with all your soul and with all your mind. This is the greatest commandment. And the second is like it: You shall love your neighbour as yourself. On these commandments hang all the law and the prophets. This can be summed up in Matthew 5:16 Let your light shine before others, so that they may see your good works, and give glory to your Father in heaven . The fruit of the Spirit is love , joy, peace, kindness, generosity, faithfulness, gentleness and self control. To be a Church of individuals active in the community, taking the gospel to the people we know and the groups we are part of. To be a Church with a commitment to personal evangelism. To be active in and supportive or critical when necessary of all aspects of community life. To provide opportunities for individual spiritual growth, identification of gifts and training. To pool our resources with other churches in order to build one another up. To continually evaluate the time, style and place of services ensuring that our worship is relevant and appropriate for all. To ensure that our premises do not discriminate against the disabled or young and have appropriate facilities for the wider variety of groups using the building. To seek God's help and guidance through regular corporate and personal prayer, attendance at fellowship groups which are available in a variety of styles and times. To constantly evaluate the life of the church in the light of the Methodist Church's overall mission as outlined in Our Calling. There are a number of regular activities held at Kibworth Methodist Church, please see Activities & Events for more details.